Hamad Medical Corporation, Qatar, is the world famous health care provider, and the first and only hospital corporation in the world to achieve simultaneous accreditation and re accreditation of all its facilities by the Joint Commission International (JCI). Hamad Medical Corporation, now inviting application for the post of Director of Nursing (PMR). Apply Direct by clicking on the link given in this post. In addition to this, HMC ask that you have held a Senior Nursing or Director post for a minimum of 5 consecutive years. 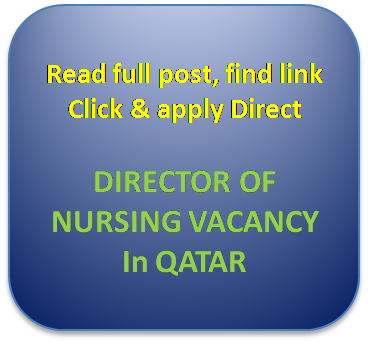 Wish to know how to apply for the post of Director of Nursing Vacancy in Hamad Medical Corporation Qatar? Wish to know what is the remuneration package of Director of Nursing Vacancy in Hamad Medical Corporation Qatar? Wish to know all details of Director of Nursing Vacancy in Hamad Medical Corporation Qatar? Please CLICK HERE to reach the search page. Then enter "Director of Nursing" in Keywords space. Then Click on search. You will get a direct link and apply directly for the post of Director of Nursing Vacancy in Hamad Medical Corporation Qatar.